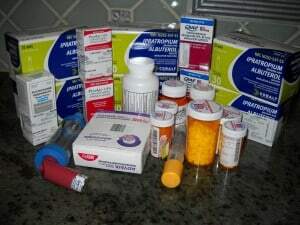 This is what a one month supply of my asthma medications looks like nowadays. Pretty scary eh! It’s Halloween at my house everyday!. Steve -that's scary!! I also like your decor!! (We need to start up some sort of AeroChamber fan club LOL. I've been meaning to post pics of how beat up mine is). However, I did find a skull in your kitchen! You should see all the crazy s**t I have in my house. Maybe, I'll take some pictures again. Yikes, makes my bedside table look quite uncluttered! Hey. 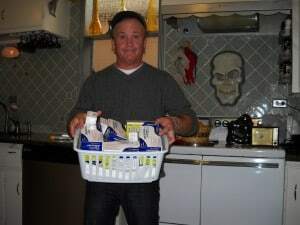 that reminds me of my months supply of meds. It seems to grow each time i go to the Drs aswell. Hope your keeping well. Wow, that's a lot…mine takes up two drawers in my chest of drawers!